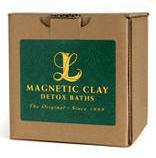 The Aluminium Magnetic Clay Bath may assist in eliminating aluminum, arsenic, lead, mercury, industrial and chemical pollutants, and chemical residues. Aluminum cans, aluminum cookware, aluminum foil, antacids, buffered aspirin, automotive parts and exhaust, cigarette filters, dyes and pigments, cosmetics, refined flours, refined foods, dental amalgams, deodorants, tap water, over the counter medication, milk products, toothpaste, tobacco smoke, and more. Kidney and liver dysfunction, hyper activity, attention deficit, decreased bone density, extreme nervousness, speech disturbances, memory loss, cognitive dysfunction, seizures, and more.